There are a total of 60 images in the samples galleries. Please do not reproduce any of these images on a website or any newsletter / magazine without prior permission (see our copyright page). We make the originals available for private users to download to their own machines for personal examination or printing (in conjunction with this review), we do so in good faith, please don't abuse it. Unless otherwise noted images taken with no particular settings at full resolution. A reduced size image (within 1024 x 1024 bounds) is provided to be more easily viewed in your browser. As always the original untouched image is available by clicking on this reduced image. Great Fullframe camera at a low cost. I must recommend this strong Machine. I have 2 full frame cameras, the Sony A7 and the Canon 5D. Leaving resolution aside, I can testify the 5Dinosaur delivers -to my eyes- more beautiful files. I am happy to be able to keep both for different uses, but for pure joy, I'll take the 5D any day. I also still use my old 5D. It holds up pretty well even to todays standards... would be interesting to compare it to todays cams. Apart from Dynamic Range the cam is still great, beating most of todays APS-C Sensors. I just got a great deal on a 5D, well that is if the "test drive" goes well. How do you get the official shutter count? Which models have the mirror default? Still worthy 10 years on because you can shoot it at any selectable ISO in RAW and it`ll be excellent, doesn`t ever get noisy (about half a stop or less noisier than the D700 or D3S in Capture one at ISO3200) , even the DR is good - JPG engine is both dated and limited but as a RAW only camera, it stands up .. Pixel level sharpness (therefore resolution of fine details) is better the D700 or D3 due to a weaker AA filter . Focus is fast enough , though really best seen as a centre focus only system due to the lack of cross sensors anywhere else , excellent on batteries too. Totally agree, except for the focus part, it can be improved for that value. I've said this many times....per-pixel Sharpness is really better than the D700 because of the very weak AA Filterblock, and Skintones (for Wedding Photographers) are also rendered much better than onto the D700. I'd stay with my 5D forever...as long as it works...and use it carefully on special occasions. After much testings around, I noticed 5D is not good at Indoor unless with the help of a Flash......However , at Outdoor I must say it is a Super duper Good Full Frame machine even though it is around 8 years old........!!! Recently I bought an Adapter for Nikon lens to Eos FX body like 5D..........It WORKS very well but have to Manually focus......So now I can have Nikon lens on 5D body which safe me a lot for a start....!! Used 5D MK-II is selling here at around Usd1.6k which I am looking forward to...!! I am using a nikkon D 5100. 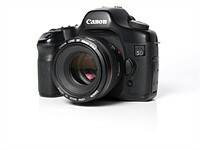 Have the opportunity to purchase a cannon eos 5d in excellent condition for $500 with 50mm f1.8 lens. Any advantages to this camera vs what I currently have besides FF? Good investment? I currently do not own any pro lenses from nikkon. Well, that is a great deal. I would do it. The 5D was and is my first digital camera. It has served me with spectacular results. It's main minus for me has been its inability to use the higher ISO's, as anything higher than 200 produces visible grain in images that I print very large on my epson 24" printer. I almost always shoot with a monopod to assure the results. Technology has changed and improved and I am searching for a replacement. I am invested in excellent Canon lenses and want to stay with Canon. I also want a camera that is not as heavy as my 5D (I am old and am fatigued by the weight of the 5D which I affectionately call "my brick".) Price is an issue too. Still casting about trying to find a replacement. hi i jus bot a canon eos 5d from a friend am i able to record video with the camera ? No, unfortunately you are not able to shot video, neither by installing Magic Lantern (because the camera is not equipped with live view). Easy answer: Buy a Sony A7 mirrorless and a metabones adapter to use all Canon AF lenses. Since you have invested in Canon lenses, I think the Canon 6D is what you are looking for, if you are still looking. Agreed! In all cameras announced around that time, only EOS 5D still attracts many discussions in DPR forums. How many are still talking Nikon D200 that announced just three months later these days? If you don't print/view in very big size, EOS 5D actually withstands most today's FF cameras very well till ISO 800/1600 in IQ, no mention crop cameras. Using the 5D with quality Canon L lenses produces images that I do not see a difference between them and those taken by a newer camera (5D II, 5D III). If video is not needed or required, then finding a clean 5D would be prudent. Some very well kept, used lightly by some hobbyists can be found at around a $1,000 or less. I have no immediate plans to shell out $3,000 or more for a newer model that is not going to give me much over the 5D, in terms of image quality. But for commercial photographers, that's a different situation. Ditto. I could not be happier with my 5D. I'm also disappointed that the set up for image comparison keeps changing. It makes it difficult to compare any older digital camera with anything contemporary. I just sold my trusty old 5D. I love the camera but I will not miss cleaning the sensor every other week and fixing dust spots in lightroom! That was always a royal pain in the neck. Still a great camera. I don't know what you mean. I own the 5D since 2006 and have cleaned the sensor only once. I have 5D3 and he also taking dust every month, in normal use, at city... without hard use, with 24-105/4 and 16--35/2.8ii weather sealed lenses... I have 5D too and i can't see any different in terms of dust problem, really. Canon say the 5D3 is weather sealed camera, maybe its true, but dust they taking at same level... I had 5D2 and it was same too... I have Pentax K-5ii and during the 3 years of using in much hard situations I can't see any dust still now... But who care about dust? now its possible to use simple swabs and thats all. 10 minutes and 1 USD per one cleaning.